Ai Ogura took his first win of the season and his second ever FIM CEV Repsol Moto3™ Junior World Championship victory in the penultimate race of 2018 – with everything going down to the final corner and the Japanese rider judging it to perfection to stay ahead to the line. That followed a crash out of the lead for polesitter and teammate Yuki Kunii, but both of the lead Junior Talent Team riders in qualifying impressed with their pace throughout Race 1. That made the fight for the final victory of the year another close one as the tussle for position in Race 2 and the overall standings heated up. Ogura was again a frontrunner and this time got the holeshot, with Kunii staying right in the group to keep both lead Junior Talent Team riders in contention for the win and podium throughout. Flying high once again in the second race but this time throughout, the Junior Talent Team took two more top finishes. This time it wasn’t quite a win for Ogura but the Japanese rider took second and was on the podium once again – with the race having been Red-Flagged when over 2/3 distance was completed and Ogura having crossed the line in P2 last lap around. Kunii completed the top five, therefore ending the season in P6 overall, with Ogura just pipping him to the post to take P5 in the Championship. Tom Booth-Amos, meanwhile, ended the first race a little early after a crash out of contention for another points finish – but after having made some good progress through the field following a more difficult qualifying day. In Race 2, the Brit was battling hard to get back into those points once again and had made some good progress, but he then suffered another crash and was out of the season finale. Gerry Salim was another who moved up from a tougher qualifying, but the Indonesian was able to keep it together for a solid finish some way further forward in P20 in Race 1. In Race 2 he closed out his season – in which he took his first points – in another tight midfield, but sadly crashed near the end of the race and was the rider who caused the Red Flag. Back in the box soon after, the Indonesian was all ok after the scare. 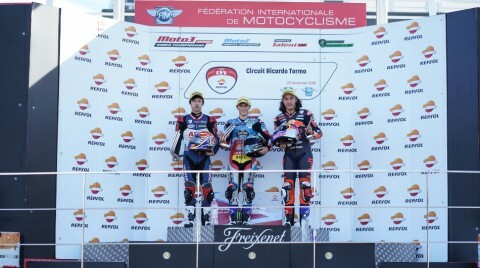 Finally, Tachakorn Buasri’s first FIM CEV Repsol Moto3™ Junior World Championship experience was a positive one. 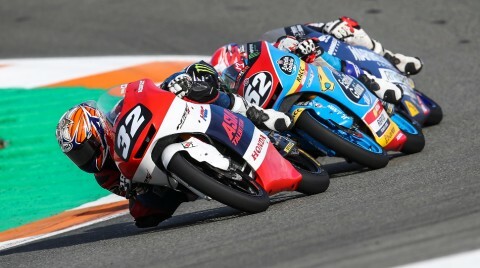 The Thai rider, who replaces compatriot Somkiat Chantra as Chantra headed for the Moto2™ test in Jerez to begin his new adventure, took P30 and was right on the tail of the more experienced Leon Orgis over the line in Race 1 – before a crash took him out of Race 2 nearing the end. That’s it for the 2018 season and now it’s time to reset and, for many, get ready for some new challenges next year. Look out for the names of the Junior Talent Team in Moto3™ and Moto2™ next season, and relive the best of the season before the lights get ready to go out for 2019.